A German district court ruled on Friday that Samsung cannot sell its Galaxy Tab 10.1 in Germany because it infringes on the design of Apple's iPad 2. The ruling from a court in Dusseldorf upholds a previous, temporary decision to bar sales of Samsung's 10-inch tablet, which competes with the iPad 2. In Friday's decision, the court said outright that the Galaxy Tab 10.1 looks too much like Apple's iPad 2, according to Bloomberg. "The court is of the opinion that Apple's minimalistic design isn't the only technical solution to make a tablet computer, other designs are possible," Presiding Judge Johanna Brueckner-Hoffman said in the verdict. "For the informed customer there remains the predominant overall impression that the device looks" like the design Apple has officially filed for ownership of in Europe. The court apparently did not compare the Galaxy Tab 10.1 with an actual iPad, but instead focused on a design that Apple filed with the European Union. The court found that Samsung's tablet didn't differentiate itself enough from the iPad 2. "The crucial issue was whether the Galaxy Tablet looked like the drawings registered as a design right," Brueckner-Hoffman said. "Also, our case had nothing to do with trademarks or patents for technology." The ban applies across the European Union to Samsung's German sales unit. That means that the German wing of Samsung cannot sell the Galaxy Tab 10.1 in its home country or anywhere else across the EU, though the court cannot stop Samsung from selling the device through other avenues in other EU countries. Samsung, unsurprisingly, has vowed to appeal the court's decision, according to IDG News. A company spokesman said the decision "severely limits consumer choice in Germany." "By imposing an injunction based on this very generic design right, this ruling restricts design innovation and progress in the industry," they said. In addition, the company has vowed to continue its own patent infringement suits against Apple across the world. In the latest expansion of the legal battle between Apple and Samsung, Apple sued the South Korean electronics maker in Japan last month, asking the government to bar the sales of its Galaxy S and Galaxy S II smartphones, as well as the Galaxy Tab 7 touchscreen tablet. The first hearing in the case was held on Wednesday, and Apple seeks damages of $1.3 million. Friday's victory is the latest in a series of legal victories for Apple. 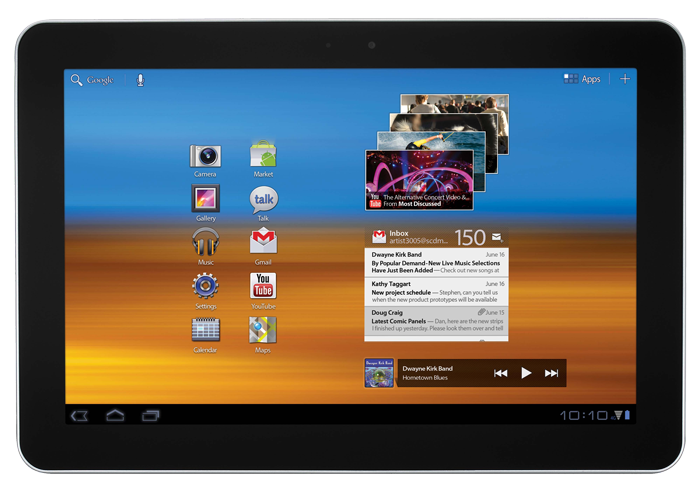 Earlier this week, the Galaxy Tab 7.7 was pulled from a German trade show floor after a court injunction forced Samsung to cease promoting its newly unveiled tablet. And in late August, a Netherlands judge blocked sales of Samsung's Galaxy smartphones in Europe, while the company has also been forced to delay the launch of its Galaxy Tab 10.1 in Australia after a court there barred its sale. Apple's legal assault against Samsung began in April, when it accused Samsung of copying the look and feel of its highly successful iPad and iPhone devices. Samsung has returned fire as well, accusing Apple of violating several patents it owns related to power consumption and 3G data transmission with mobile devices. Lawsuits have been filed by each company around the globe.